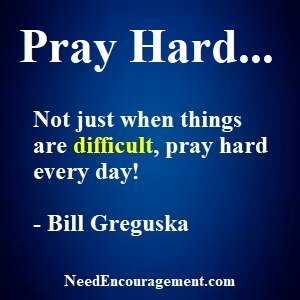 You will certainly benefit when you pray hard! Here are some encouraging scriptures about ways you can pray hard. Times When You Talk With God! Do You Want To Learn How To Talk With God? Trust in God because He loves you and hears your prayers! Why is it that only when a crisis like death, physical problems, financial problems, etc.? Do you believe that God hears your prayers? Do you think God answers the prayers of a righteous man or woman? I had prayed many times when my back was up against the wall in a tough situation. One of the reasons that we pray is because prayer gives us answers from God that we might never have thought of without prayer. Also, we can see answers that previously were foggy and unclear. Pray Hard Like Martin Luther King! Actually, what does it mean to pray without ceasing? Some hindrances to a healthy prayer life? How Do You Talk With God?